We seem to have drifted back to our ongoing habit of mixing our creative talk with our daily life emails, and because I've missed our Tea and Talk get-togethers, I thought I'd sit down at the virtual cafe (I'm picturing Boc Boc) and order us both some tea and cake, and start a conversation. Would you like the Victoria Sponge, or the chocolate cake? Or shall we split them and each have some of both? Actually, that's wrong. You started the conversation on your blog with your post "How Sketchbook Skool Peddles Conformity". I've been thinking about your post and wanting to reply so I thought I'd do so here. What really hit me when I read your thoughts about Sketchbook Skool is how totally different they are from mine. Which is not to say I disagree, necessarily -- I just would never in a million years have looked at it that way, and your feelings about it are so different than my own. Once again, you have really made me stop and think because your view of it is so different from mine. You said that "I believe the real product Danny and Koosje are selling ... is the enabling of the social habit of conformity....Suddenly its ‘normal ‘ to sketch. Everyone’s doing it. We don’t want to be left out and we are welcomed when we share." See? Right there. It is fascinating to me that you see the Sketchbook Skool experience in terms of conformity. We've discussed before how you've been uncertain about the value of sketching to you. You didn't see the point of my sketching that lemon, for example, and couldn't see why you'd want to do that sort of thing, but that you were starting to understand the appeal of travel sketching. At the time, it seemed to me that you didn't appreciate or enjoy sketching for its own sake. 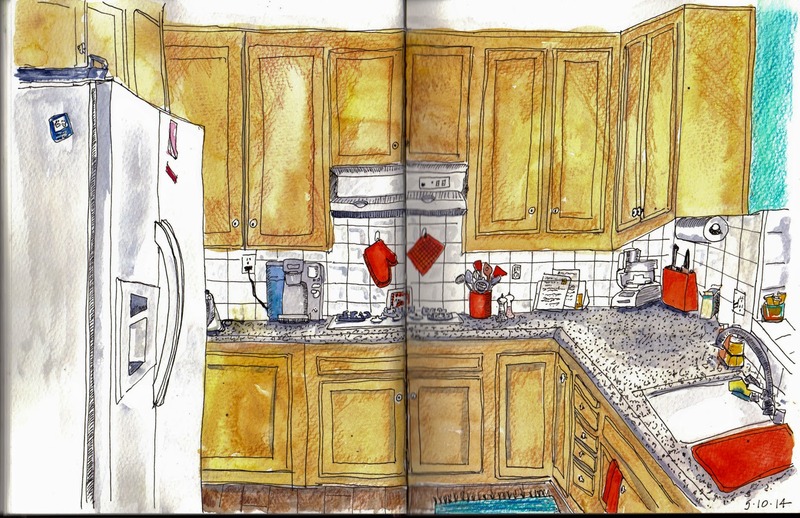 Has the Sketchbook Skool experience changed that for you? On your blog, you've talked about " 'informational conformity,' where we change our behaviour to be ‘correct’. I think this is what is sucking me in so much to the Skool Facebook group. Of course, having subscribed, I could simply watch the videos, be inspired and then do nothing... But when your News Feed is full of people showing their homework and telling their stories of sketching trips, it feels like you ‘ought’ to join in if you don’t want to be the class slacker wasting her money and, better, it feels fun to join in. Welcoming and social. Then, because you see demos from a number of teachers, you have a range of ‘correct’ behaviours and can choose which one suits your style and use it as a template for exploration." Again this is fascinating, because this is not what the Sketchbook Skool experience has been about to me at all. Do you feel that the Sketchbook Skool environment -- knowing you are part of a group of people who are also starting to sketch, being able to show others your work and get their compliments -- makes your participation permissible? Or "correct" somehow? Do you think that if it had turned out that only 5 people signed up for Sketchbook Skool, and no one was posting their sketches or comments, you would be less inclined to do the sketching and try the methods the teachers' videos demonstrate? I read your blog post as describing how the group dynamic is what motivates you, especially in giving you permission to do something that you fear is ultimately impractical to you, and in giving you a vehicle for accountability. If the Sketchbook Skool framework were not there (say, in between this session and the next), will you keep sketching? Or is your interest in it dependent on how active the Sketchbook Skool facebook page continues to be? Or has the group presence motivated you, but that you are now developing sketching for its own sake? I'm asking these questions with real interest. I have seen your sketching change so much over recent months so that it's clear to me you are getting better at it -- but I have not heard you talk about your enjoying the process of it. Which brings us back to that same distinction I keep thinking about, that "process" versus "result" thing. Maybe it's not that simplistic, but your blog post makes me think of it in a new light because the concept of "conformity" just doesn't apply to the role Sketchbook Skool has played for me. If anything, I tend to want to head in the opposite direction when people start jumping on a bandwagon. I guess I'm a lot more comfortable with non-conformity! You know that I've been sketching now for a number of years, and that I've really enjoyed finding friends to sketch with and going on sketching outings with them. But for me, that is about the sharing of the process, being with others who share my enthusiasm and who inspire me, and having a back-and-forth exchange of ideas and work. It's not that I need to have others to sketch with because otherwise I'd feel uncomfortable on my own. It's not about the presence of others giving me permission to do something I know I enjoy. Partly it's that having someone along to chat with makes the experience more fun, and can give me new insights, and connect me with new people. It's sharing versus conformity, to me. Mainly, I just like the sketching. So I'm happy to do it home alone, or out in the world on my own, and I don't share a lot of what I sketch, just because...well, because it's the doing it that's important to me. I have a small group of sketcher friends online and I share most stuff with them, because we all started learning together and have become friends and seem to take the same view of the process. In that group, I think our sketches have become short-hand ways of talking about our experiences. We are sharing our lives through our sketches, so posting sketches to them isn't about "look what I did," so much as it's about "here's what was going on in my life at that moment." At any rate, I have really been struck by your viewing the experience as one about artists "embracing conformity," while for me it is pretty much the opposite -- I see it as being about how delightfully individual the sketching experience is. This feels a bit like you are feeling the elephant's trunk and I am feeling the elephant's ear so we are touching the same animal and having totally different experiences. Which is why I love our conversations. Your end of the elephant always surprises me.